Should I be at #SheSpeaks15? Today my daughters and I drove 100 miles from Greenville, South Carolina, where we have been visiting my longtime ago college roommate, Katie Barnett and her family. We drove to Concord, North Carolina for She Speaks, a Christian women’s writing and speaking conference through Proverbs 31 ministries. 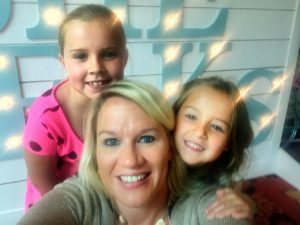 Leg one is a big Southern adventure for the girls and me, a purposefully planned getaway. It is richly rewarding to renew friendships, face to face, rather than across miles through social media and an occassional phone call or texting. 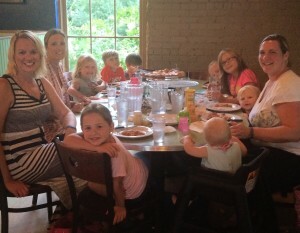 Three mamas and eight kids out to eat in Greenville this week. We play zone defense! But today I had to leave the comfort of friends to get to She Speaks. Staying at Barnett’s house would have been easier. I wasn’t feeling brave. 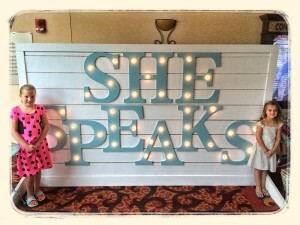 Instead of attending Blogher for a fifth year in a row, I made the decision last year to attend She Speaks. 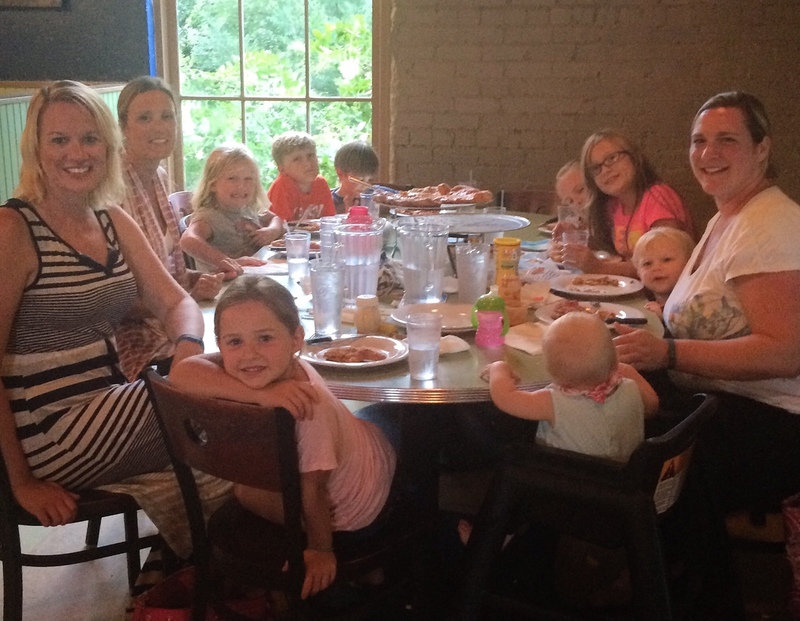 I have met tremendous connections at Blogher but I felt a push last year to go in a different direction. I cannot squeeze two conferences in the summer within a month. Especially not this summer. Everything about this summer feels like it is an upheaval. It hasn’t gone “as planned.” None of it. God is working on something greater. I cannot see it. Despite our hurting, our confusion at times on what is the next step, I have a deeper sense of trust than ever before. But of course, doubt sets in. It set in today. We were seated three minutes before the pre-conference sessions started. I don’t know anyone here. I am secure in myself and meeting people usually. I love connecting. My girls were next to me at the conference until our lovely cousin and friend Vienna arrived to play with them for a few days while I attend the conference. My sister just had a baby. Maybe I should be home? I should not be here. No one here is like me. I live in North Dakota, in the middle of the prairie, where flax fields are blooming and barley is nearly ready to harvest. It’s my favorite time of year at home. Instead of melting in Carolina humidity, I should be home. She Speaks was a big idea last year and in February when I signed up I felt brave. But certainly I should be home right now. I do not feel brave. I do not feel like connecting. Not here. Are these my people? I thought they would be more than Blogher. But maybe a Christian women’s conference in the South isn’t for this lifelong North Dakotan. I’m a prairie mama. Not a Southern belle. Do I belong here? I know marketing. I know agriculture. I can speak. I do speak. I can write. I do write. But these women probably have more spirituality in them than me. They might talk it and walk it better than me. The conversations in my head spun a thick web. The enemy works wicked ways to bring us down so quickly. I met two Texan women while I was charging my phone at the end of the pre-conference session. I shared where I was from and a bit of my background. One of the women shared about growing up on a farm and how most city women at this conference wouldn’t understand how much faith goes into farming. It sparked me to open up more of what I do usually during the day, speaking and marketing in food and agriculture. I looked at her surprisingly. Feeding the world? Agriculture. It is a passion. It’s where I am rooted. But I wasn’t even going to talk about it here. Then I looked around. Maybe I should. It’s who I am. It’s where I am at. 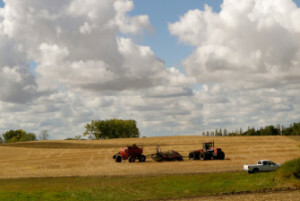 Food, farming and faith. She is a part of the circle and communities I love. Rural women who love Jesus. Rural women who love farming and the land. She is my people. I felt at home. At peace. Am I suppose to be at She Speaks? Absolutely. God humbled me, reminding me there is a far greater purpose and plan to why we are here. It’s far beyond anything I know today. But tomorrow is a new day. I won’t spin a confusing web in my head to drag me down. I will stand firm in Him. I am proud to be here with my daughters nearby, learning from others and defining a path forward that God has in store. Tomorrow is a new day that God has made. To kick it off, I’m meeting the Alabama farm mom for breakfast to walk into our first ever She Speaks session together. I am right where I am suppose to be. God already knew that but I learned it today. This was so awesome to read today! I just registered for SheSpeaks2016 and instantly, the enemy wanted to bring doubt and fear my way. But thank you for this!